Sanitation control during the cheese processing is paramount in order to maintain the food quality as well as prevent health risk associated with the contaminated product range and therefore sanitation of equipment directly contacting to the cheese is obligatory, among the conveyor belt is equally substantial, and therefore we as a manufacturer of the conveyor belt have brought forth the best in class quality range of the cheese processing conveyor belt that is designed to meet sanitary standards of the dairy regulations, is a bottom-line of our years long experience in the manufacturing dairy processing conveyor belt. The material (PVC/PU) used in the manufacturing of the conveyor belt is non toxic and is also formerly quality tested to ensure its farthest quality. Nonporous of the finished product is one of the major attributes of our cheese processing conveyor belt that assist in maintaining the high level of the hygiene across the life span. The cheese does not stick with the conveyor belt, thanks to the resistivity of the material against the oil and fat that decreases the product loss, enables easy cleaning, reduces downtime and ultimately increases the productivity of your venture, and hence is hugely accepted in processing any type of cheese, be it cheese slices, cubes, blocks. 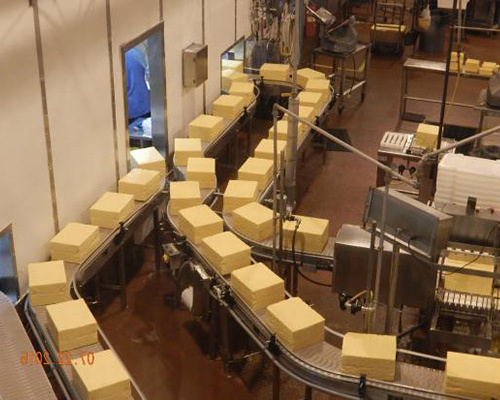 Besides that, the heat resilient aspect of this cheese conveyor belt makes is ideal for the processed cheese too. Get our conveyor belt for cheese processing, known for maintaining foremost hygiene and not altering the flavor of the cheese at the end of processing, available in the widest range of the size and length and also in the custom made to meet your specific needs.